How do you sum up a life of the person who influenced your life the most? My father, John R. Finnegan, Sr., was an incredible man. He grew up in Walker, MN on Leech Lake. His grandparents, Bert and Louisa Chase, built and opened the Chase Hotel or “Chase on the Lake” in 1922. Dad was born in 1924 to Bert & Louisa’s daughter Isabel, who was married to William Finnegan. Dad spent his summers in Walker working as a bellhop and fishing guide at the hotel. In the fall he would be back in Minneapolis for school. After graduating high school in 1943 the army came calling and as all boys did at that time, he answered. Dad survived battles such as The Hurtgen Forest, the Battle of the Bulge, and the Remagen Bridge. His interest in writing and newspapers had been well established since high school and his commanding officer let him write and publish their battalion journal. Upon release from the army he enrolled at the University of Minnesota, eventually receiving his degree in journalism with a minor in political science. In 1948 he married my mother, Norma Tomte. They proceeded to Rochester, Minnesota where dad worked as a reporter, photographer and editor for the Rochester Post Bulletin. 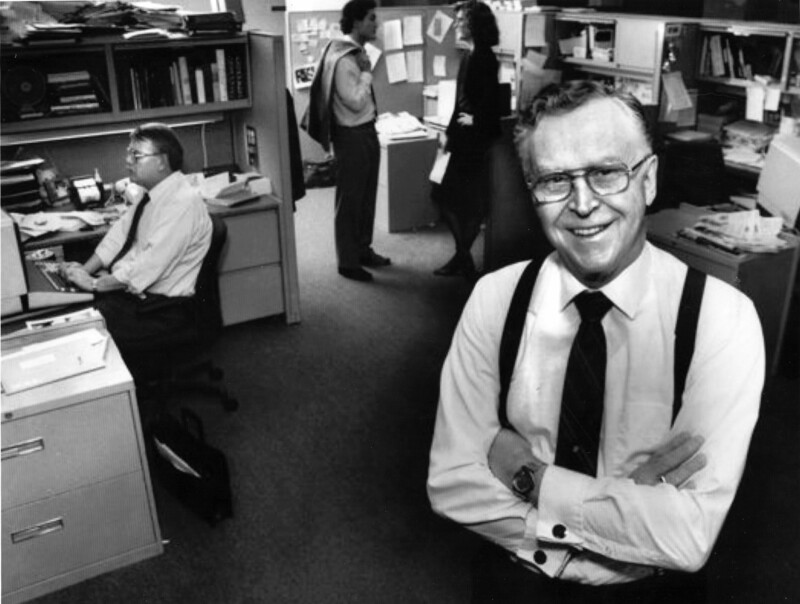 In 1951 my father joined the Pioneer Press as a night assignment reporter and quickly moved up the chain to become associate editor of the editorial page, then made executive editor in 1967. He retired in 1989 as senior vice president and assistant publisher. My dad’s honors include membership in the National Freedom of Information Act Hall of Fame, the State Open Government Hall of Fame award for 2011 from the National Freedom of Information Coalition and the Society of Professional Journalists. The most amazing thing about my father was how approachable he was. At his wake, I had more than one person come up to me, offer condolences and then relate a story about my dad on how he had first hired them or influenced their career and how they would seek him out for advice. I remember many times growing up, visits from local media types and long phone calls and discussions concerning journalism and editorial decisions. My father was instrumental in getting me interested in typography. I would sometime accompany him on Saturdays down to the Pioneer Press office. I loved to hear the teletype machines in the newsroom and I would get to visit the press room where I would meet the linotype operators. They would show me how they set lead type and compose the newspaper and give me type slugs. I was hooked and my career path was set into the graphic arts. Each one of my siblings has a special memory of our dad. I have so many because I shared many of my father’s favorite leisure activities, in particular golf and fishing. My favorite memory is when I was about 10 years old. Our family was lucky enough to stay in a cabin in Itasca State Park on a small lake in the northwest corner of the park called Squaw Lake. The cabin had no running water and only outdoor bathroom facilities. Rustic to say the least. We had a dock and a boat and we were the only cabin on the lake. Heaven for a family of 5 kids on vacation for a week or two in the north woods. In the morning at 5:00 AM, my father would wake me and we would make our way down to the dock with fishing poles in hand being as quiet as we could be. We could hear the loons and the lake was usually smooth as glass. The boat was an old wooden rowboat provided to the cabin occupants by the MN DNR. It had no motor, just a set of wooden oars. The sun was still not up but was pushing on the horizon behind the forest. Mist was rolling out of the woods over the lake and we were surrounded by all the wonderful north woods smells. The air was cool and the only sound heard was the creaking of the oars and the smooth sound of water slightly rippling around the bow of the boat. It was that memory that seared two indelible things into my being. The first was an undeniable belief in a power greater than our understanding would allow because of the awesome beauty surrounding us. The second was the just time spent with my father. It was wonderful and that memory was something he and I had together. Over the years we fished, golfed, discussed politics, business and family. Just like his colleagues, I always sought my father’s advice. He never told me directly to do something, he would present his advice and let me make the decision. Not that all my decisions have been good but he always told me how proud he was of me for chasing my passion and having the guts to start my business. Even during these recession years he was supportive and proud that we were surviving. Since forming Boxing Cats Creative and working at home with my wife, Pam Randall, my parents were daily visitors to our home. We didn’t get the daily paper so my parents would stop by at 10 AM to visit, have coffee and get their cat fix from our two resident Boxing Cats, Kyoshi and Oolong. The cats got accustom to seeing them every day and would ready themselves each morning for my folk’s visits that would culminate in a vigorous brushing. I can tell they are missing that. It was a special thing to see my folks almost daily these last couple of years. He was part of the rightly named “Greatest Generation” . He was an extraordinary journalist and patriot, fighting for the right to open and transparent government for the people. He was about family and faith. He was an incredible role model for what a husband should be, married to my mother for 64 years. He was my mentor and friend. But the greatest privilege for me was calling him “dad”. He will always be with me, in my heart and in my soul. I love you dad. « What’s up for 2013. You are currently reading Mentor, Friend, Father… at Boxing Cats Blog.